Google installed a 1.6 MW solar panel array at its headquarters in Mountain View in 2007. The question was, “Does cleaning the solar panels make them more effective?” They analyzed the mountains of data collected about the energy that these panels produce — after rain, after cleaning and at different times of the year. There are two different sets of solar panels on the Google campus — completely flat ones installed on carports, and rooftop ones that are mounted on an angle. Since the carport solar panels have no tilt, rain does not do a good job of rinsing off the dirt they collect. (Also, the carports are situated across from a sand field, which doesn’t help the situation.) After cleaning these panels for the first time after they had been in operation for 15 months, their energy output doubled overnight. Ceaning them again eight months later and their output instantly increased by 36 percent. 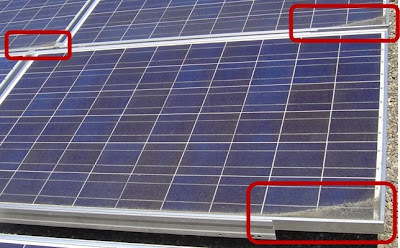 In fact, Google Staff found that cleaning these panels is the #1 way to maximize the energy they produce. As a result, they have added the carport solar panels to their spring cleaning checklist. The rooftop solar panels are a different story. The data indicates that rain does a sufficient job of cleaning the tilted solar panels. Some dirt does accumulate in the corners, but the resulting reduction in energy output is fairly small — and cleaning tilted panels does not significantly increase their energy production. So for now, They Mother Nature take care of cleaning the rooftop panels. If you want to learn more about the solar study, check out these slides showing the effects that seasonality, tilt, dirt, particulate matter, rain and cleaning have on Google’s solar energy output.